What’s the problem with the dryer? Is it not drying clothes? Does the cycle last longer than usual? Is it loud? 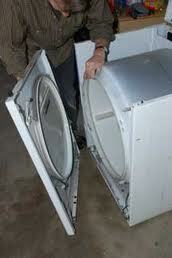 All issues related to these home appliances are handled fast by our Vaughan dryer repair technicians. We offer local services, help quickly and can take care of any dryer issue. Our company, Appliance Repair Vaughan, guarantees top spare parts. We keep them in our vans in order to replace anything damaged in no time. Trust that each dryer job is done on time and in compliance with any local safety regulation. Count on our local appliance team to fix your dryer and also install your new one. Servicing home dryers is our job. We do it well and on time to eliminate any possibility of accidents. When you need dryer repair in Vaughan, just ask our help. If there are specific problems with the appliance, our technicians will fix them right away. If you don’t know why your appliance doesn’t dry well or makes noise, let us find out. We start by troubleshooting the current dryer problems to see which parts are problematic. Our dryer repair experts always check the amount of lint trapped inside the pipes and remove it to allow the dryer to work safely and properly. Built-up dryer lint can lead to safety hazards. Although our company offers emergency assistance, we always recommend to our customers to call us for regular dryer service. With routine, annual inspections, we don’t only fix minor problems and do what we have to make the appliance operable but also pay attention to the lint trap. We empty lint from the tubes and make sure the appliance is able to breathe well in order to perform properly. You can trust to us the service of any household dryer. From regular ones to all-in-one washing machine and dryer appliances, we can take care of all of them. These dual appliances are special but rest assured that we have expertise in washer and dryer repair services. We also install new dryers with full respect to local safety rules and personal needs. Call our company if you want professional dryer installation, service and repair in the Vaughan, Ontario area.